On 2 May 1983, Recruit Communications Operators Course No. 1 commenced an eight-week training course. 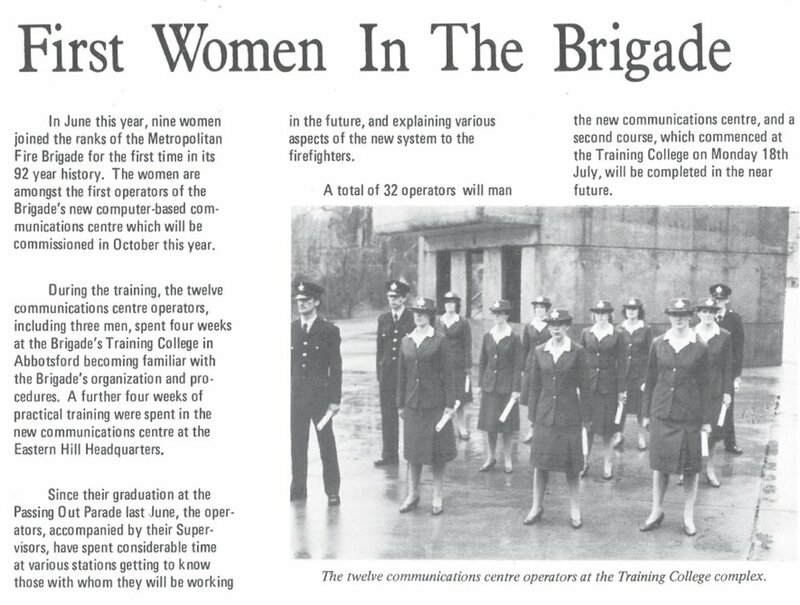 Graduating in June 1983, this first course included three men and nine women – the first operational women in MFB history. At the beginning of 1983, an advertisement appeared, calling for operators in MFB’s new computer-aided despatch centre at Eastern Hill. Successful applicants were required to type 35 words per minute, speak with a clear voice and pass a medical examination. The benefits were appealing and included a uniform, career advancement opportunities and an attractive salary. Newspaper reports on the historic occasion of the first graduation of women operatives said many of the firefighters felt that ‘the girls added a bit of colour to the brigade’. The first training course for communications operators included three men and nine women - the first women to take on operational roles in MFB’s 92-year history. The new female operators were excited to take on such a meaningful and well-paid job and were undeterred by the male-dominated workplace. Former Communications Operator Eileen Rudd (née Richardson) remembers that, while there were some commenting that ‘women should be in the kitchen not in the Comms Centre’, many in the organisation were excited by the skills women would bring to the role. Before long, these first female operators proved they were highly professional, holding their own in the face of resistance and making their mark alongside their male colleagues. The desk height of the new $3.4 million communications centre was built to accommodate an average man. With a majority of operators women, it was not uncommon to see phonebooks hidden underneath desks used to prop-up foot pedals. The impracticality of the women’s uniform was felt when serious call-outs required operators to run down two flights of stairs, cross the street and climb into the communications van to provide onsite support to the firefighters. The new recruits spent weeks at MFB’s Victoria Street Training College learning all they could about the brigade – the Act it was governed by, its many departments and services – and, most memorably, how to march in formation in their blue blazers, skirts and heels. The communications operators trained alongside firefighters until the firefighters broke away to learn the physical aspects of their job while the operators were taught to navigate the new computerised system – Firecom. This specially designed system dramatically improved the way MFB responded to emergency calls. Being a new team in a brand new facility gave the operators the chance to create their own workplace culture. Being predominately female, there was a feeling of ‘instant camaraderie’. However, there were occasions when the women were made to feel inferior. Former Communications Operator Amanda Robinson recalls occasions where she was ‘spoken “down to” by male supervisors who had superior attitudes about themselves’. Despite these instances, the atmosphere was changing. It wasn’t long before the new Centre and its operators established themselves and exceeded even the most ambitious of expectations. It was an exciting, supportive and encouraging time. Film showcasing the MFB state of the art Communications Centre c1990s. Getting firefighters to emergencies as quickly as possible is a constant challenge for MFB. From watch towers on hilly vantage points to street alarms connected to the nearest station, communication and despatch has changed greatly over time. From 1971, the control centre at Eastern Hill handled all communications for MFB using a large map with a system of lights to indicate station availability and radios. Everything was manual. By 1978, this system needed an overhaul. MFB worked with Phillips Telecommunications to develop a state-of-the-art computer-aided despatch and automatic alarm monitoring system called Firecom. While Victoria’s police and ambulance services still relied on manual systems, MFB blazed a trail with Firecom. From the time it went live on 7 October 1983 until 11 July 1996, Firecom was the first port of call for all fire-related emergencies in metropolitan Melbourne. In 1995 the Victorian Government introduced Intergraph, a centralised, privatised emergency response service for the whole state and MFB’s Communications Centre signed off for the last time the following year. MFB Operators were offered the choice of applying for jobs with Intergraph or remaining with MFB in various roles. The team was disbanded.